Polar Flow is the online window to your training, activity and sleep. It works seamlessly with your Polar product and helps you track your training, analyze your progress and achieve more. Available on desktop and mobile. Plan individual workouts or create a personalized training plan, sync it all to your Polar product and train smarter with live guidance. Get personalized feedback about your workouts, overall activity and sleep. Analyze on the go with the Flow app and in-depth in the Flow web service. When you choose Polar, you get access to the full Polar ecosystem where everything is connected. 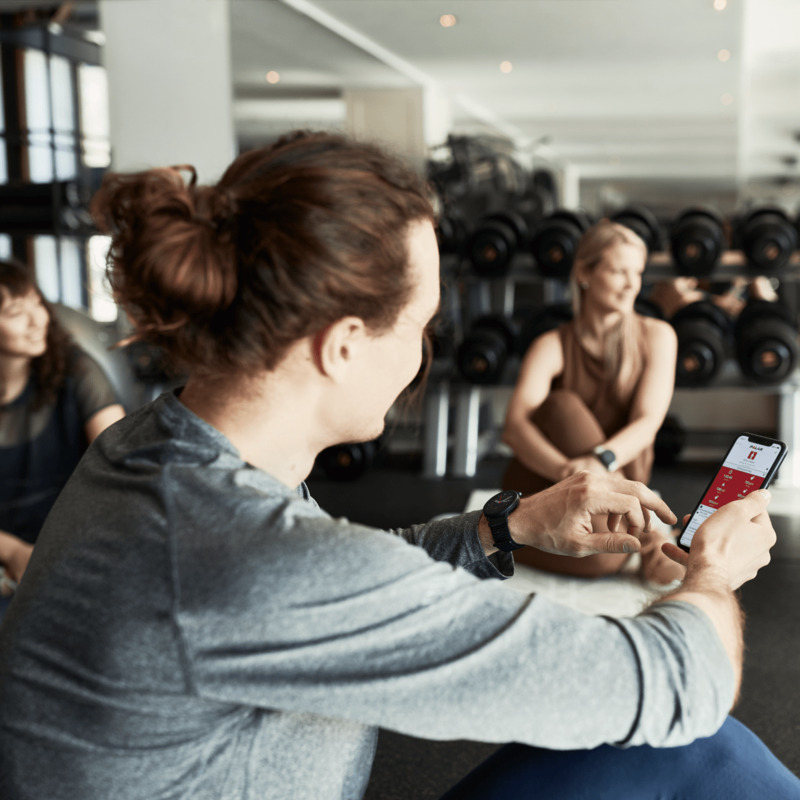 Whether you do a workout with the free Polar Beat fitness app or take a group exercise class at your gym with Polar Club, your training data will be easily available in Polar Flow. Choose from over 100 sports and add your favorite sport profiles to your Polar sports watch in Polar Flow. You can add up to 20 sport profiles to your sports watch and customize individual settings for each. With Polar Flow you can conveniently plan your workouts by creating training targets. Sync your training target to your Polar product for training guidance. You can choose from several training target types, such as Quick targets or Phased targets. Quick targets are an easy way to create guided sessions. Set specific training targets – like 'run 5 miles' or 'burn 400 kcal' – and let your Polar product guide you through the workout. With phased targets you can split your training session into phases and create a different target duration or distance and intensity for each of them. Use a phased target for creating an interval training session or adding a proper warmup and cool down phases to your session. 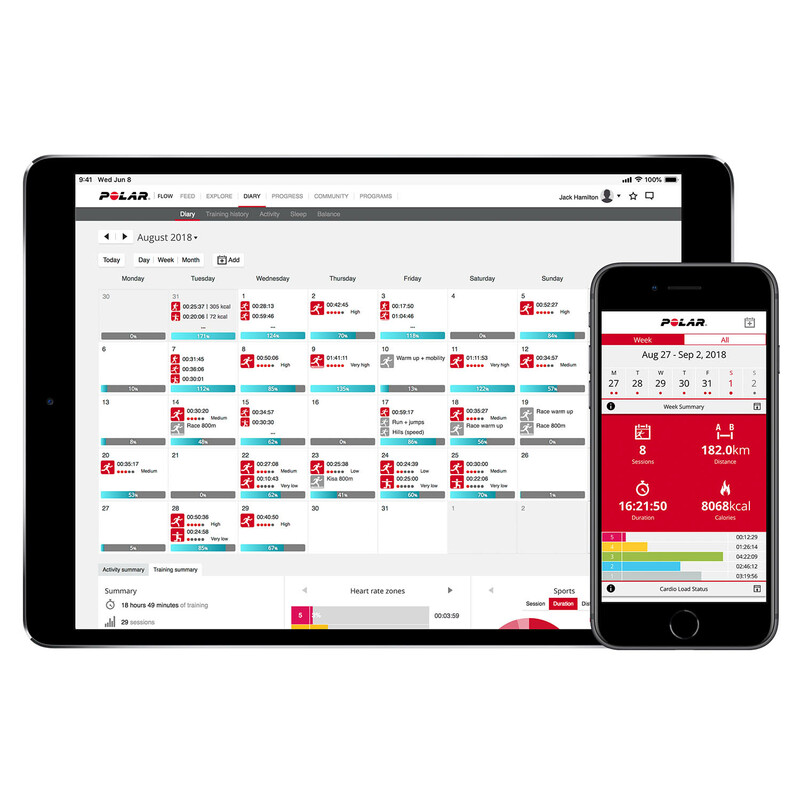 Polar Flow's Season Planner is a powerful tool for creating a tailored annual training plan. No matter what your training goal is, Polar Flow helps you create a comprehensive plan to reach it. Periodize your training, set weekly volumes through e.g. duration or distance targets. Add main targets for the season such as competitions or races and plan training focus areas with colored themes on a weekly level. You can easily create individual workouts or training targets per sport and add them as favourites to create your personal training target bank. These targets are convenient when you're planning a training program – just drag and drop a target from favorites to your plan. Once there they're conveniently synced to your Polar sports watch. Follow your planned versus realized trainings and seasonal volumes on granular level with extensive set of stats such as season totals, weekly heart rate zone distribution and many more. You can also adjust the on-going season or make an entirely new training program. Training for 5K, 10K, half-marathon or marathon? Polar Running Program is a free adaptive running plan that fits you and your goals. It’s personal and easy to use and it guides you through your training and makes sure you’re in top condition come race day. Polar Running Program looks at your training history (if you’ve logged enough training in Polar Flow), gauges your current activity level and prepares a personal running program for you in seconds. You get more than just a running plan – your Running Program also includes guided supportive exercises to help you get stronger and prevent injuries. The tutorial videos are available on Polar Flow. Once ready, your plan is synced to your Polar sports watch to make sure every run and each supportive workout is conveniently available. Your Polar product will guide you through each run. You can follow your progress and see how your performance is developing in the Polar Flow web service. You'll see your program stats and an estimate of your finish time. Get to the heart of your performance with the extensive training analysis tools. 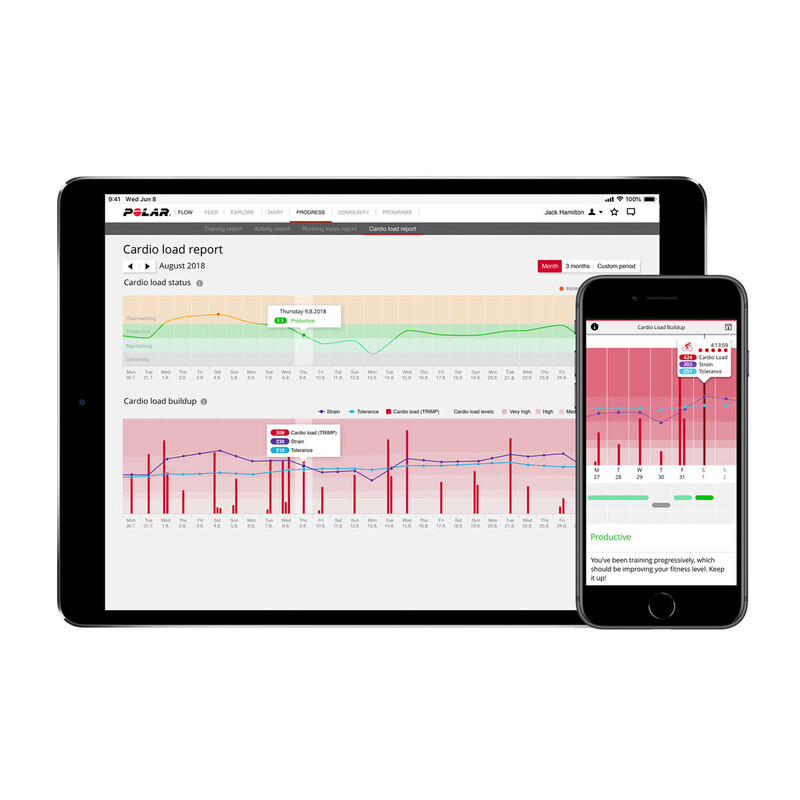 With Polar Flow, you'll get a detailed analysis on everything you have accomplished - single training sessions, test results, activity, sleep and even recovery data. With reports you can keep track of your training progress and trends over a longer period of time. You can also export training and R-R recording sample data for further analysis. If you want to train like a pro, you need to recover like a pro. With Polar Flow and Polar sports watches and fitness trackers you get data that helps you find the right balance between training and rest and stay injury-free with a uniquely holistic activity, sleep and training load and recovery tracking solution. Track your steps, distance, calories and sleep. Polar Sleep Plus gives you valuable insights to your sleep. *Available on selected Polar sports watches. 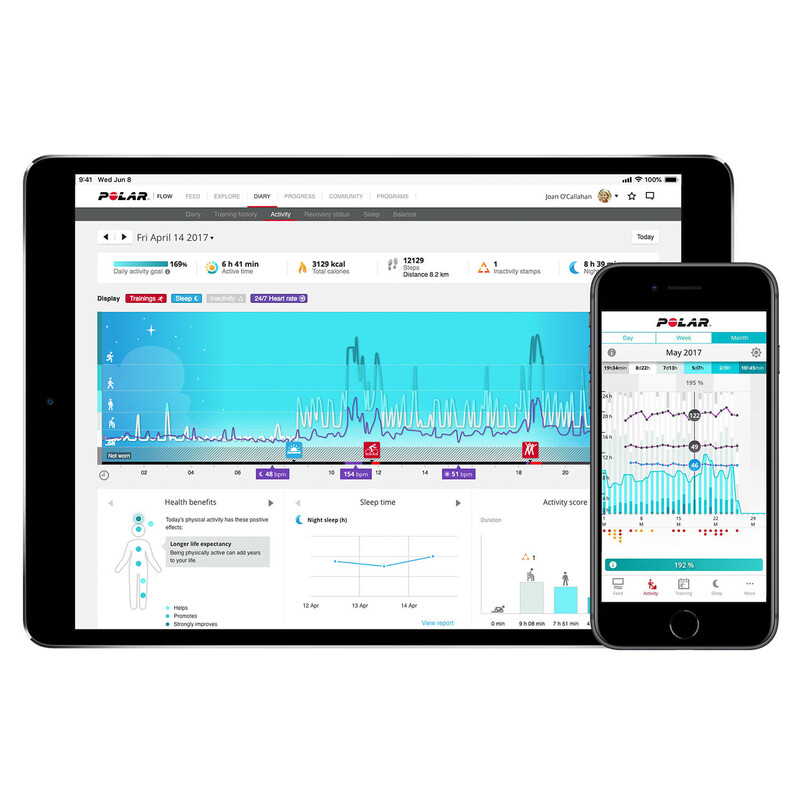 Polar’s unique Smart Coaching features available on Polar sport watches and fitness trackers turn your training and activity data from raw numbers into actionable guidance. PERSONALIZED FEEDBACK The guidance you get from your Polar product is based on your personal metrics. POWERED BY SPORTS SCIENCE All our training solutions are built on scientific research and validation. FIND THE BALANCE Making progress and achieving goals is about balancing training and recovery. Polar Smart Coaching will guide you towards this balance. 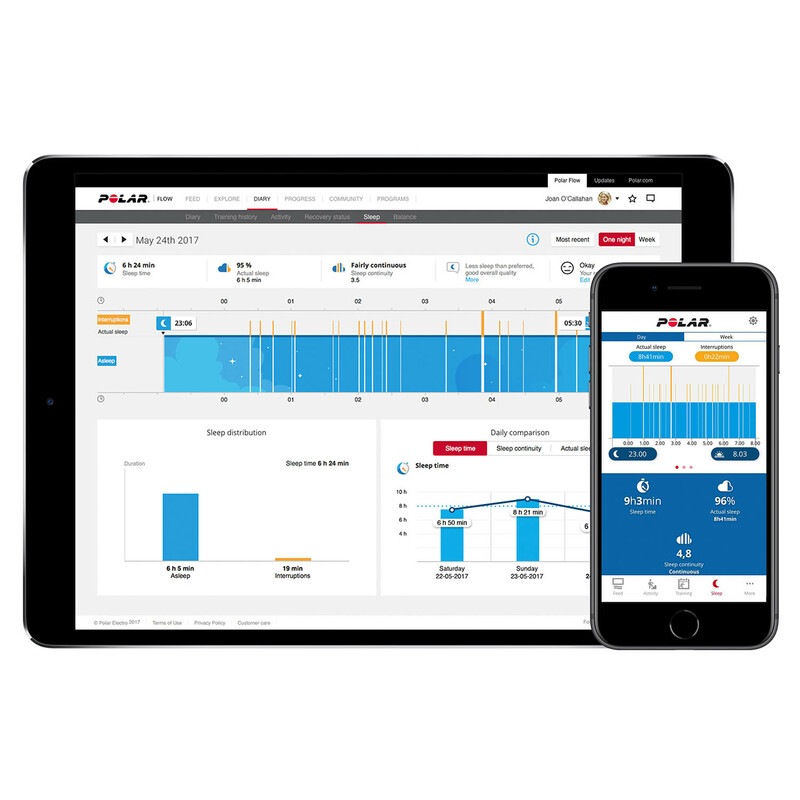 Create tailored training plans together with your coach or PT, train and get powerful analytics and actionable training insights with Polar Flow for Coach. Together with your coach you can easily set targets for individual training sessions or plan ahead for the entire season to perform at your peak on race day. Your coach can dig deeper to get a detailed analysis on everything you have done - single training sessions, test results, activity, sleep and even recovery data. With reports your coach can keep track of your training progress and trends over a longer period of time. This will not only help you and your coach analyze your current progress, but will also be useful when planning your next season.